Day 8 of 30. Making Progress! – 30 Day Detox… What?? Day 8 of 30. Making Progress! Again, I’m not in this for the weight loss, but I’m happy if that’s a nice side benefit. Everyone who goes on this detox gives beginning measurements, then after you start you weigh in and remeasure each Monday. Today, I woke up, and that’s the first thing I did. Oh. My. Lord! I couldn’t believe my eyes when I looked at the scale! I lost NINE pounds! In one week on dietary changes alone! I took my weight twice just to make sure it wasn’t a fluke. Medically, I’ve noticed a couple of other improvements also. I’ve had issues with plantar fasciitis for a few years now. Usually, when I wake up, the first 20 steps of the day are kind of hard. They hurt and I have to force my feet to move the way they’re supposed to. I realized today, I haven’t felt that pain in at least two days! Also, I’ve had a lot less back pain, which has been an issue for YEARS! Another thing that’s changed is the quality of my sleep. My mom’s family (my grandfather, aunts, and cousins) suffer from something I’ve dubbed “The Harkness Curse”. It’s an inability to fall asleep and/or to stay asleep. There have been nights I’ve woken up at 2:30am and have stayed awake for the day. My body just decides that’s all I need and will not shut down again. Well, that is a thing of the past! I’m still waking up at night (I’m drinking a LOT more water), but I can fall asleep again without a sleep aid. It’s miraculous, and I’m much better rested. Do you hear that, Harknesses?! It’s possible! You just have to yank out your sweet tooth! Next up for the day is actually the first thing I ingest every day. It’s Arbonne Digestion Plus. Oh, boy, that stuff is gaggy. It’s not that bad as you’re drinking it, but once you stop, you get the full blast of the vitamin-y flavor, and it’s tough to get past it. Interesting fact: I’m told, the more toxins in your body, the worse it tastes, and as I go through this month it’ll start to taste better. I remain cautiously optimistic. I took the lid off the blender to scrape the sides down before finishing up the mixing, when a bug fell in. We have little moths that hang around this old farm house, and one chose that exact moment to take a kamikaze flight straight into my nutty, delicious shake! I tried to get it, guys… I couldn’t find it! Then a thought occurred to me as I stared into my blender. People in Asia eat live cockroaches… I hit the liquefy button and mixed that guy right in. Extra protein, right?! Dinner was great, again. 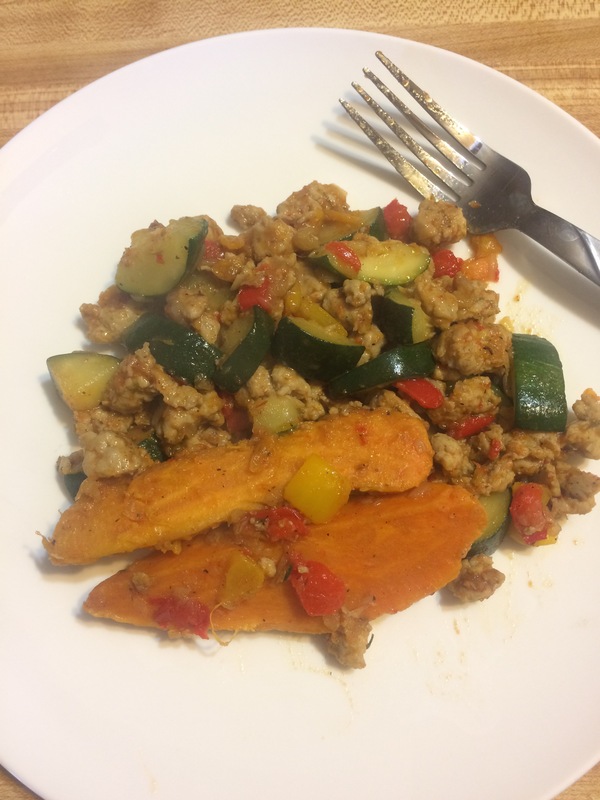 The recipe is a one pan meal and calls for turkey sausage, but it was really hard to find. We ended up making our own. My mom bought ground chicken and used a sausage recipe to add the right spices. The dinner recipe also included lots of peppers, onions, and zucchini. I loved it! Day one of week two was another success! This detox business seems to be getting a little easier every day. Work days are definitely easier than the weekends, but I’m sure that’ll get easier as well. I’m making progress, and I can’t ask for more than that! I’ll take less moths in my shakes though,.. Previous: Previous post: Day 7 of 30. Movie day! Next: Next post: Day 9 of 30. Staying the Course.